Light flashes can happen when the vitreous fluid pulls on the retina. This can tear the retina and pull it away from where it usually sits, which can cause permanent damage to your sight. If you see light flashes in dim light or at night, usually you don't need to worry. However, if you see flashes of light during daytime, you need to have your eyes checked urgently (on the same day) as this can be a sign of an early retinal detachment. 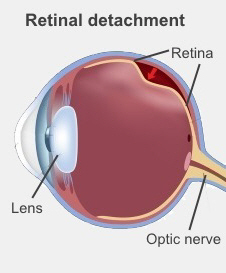 have a parent or sibling who has had a retinal detachment. People with diabetes are also at increased risk of a different type of retinal detachment as a complication of diabetic retinopathy. Retinal detachments occasionally happen in people with no history of eye problems or injury. Migraine sufferers can experience a different type of light flash called an aura. An aura is shimmery lights and zigzag patterns in your vision, sometimes followed by blind areas. You may or may not get a headache and nausea after this. If this is new for your then see your doctor. In later life, people with a disease affecting their blood vessels (their vascular system) may experience visual symptoms. For example, suddenly losing vision in one eye can be a sign of a transient ischaemic attack, also called a mini-stroke or TIA. If a TIA happens in your eye it is called an amaurosis fugax, and this shows you have an increased risk of stroke. If you suddenly lose vision for any reason, you should urgently see your GP, optometrist or ophthalmologist that day to find out what's causing it. See your optometrist, ophthalmologist or GP today if you have any of the four Fs. Flashes – suddenly seen during the daytime. Floaters – new (in the past one or two weeks) or larger than before. Falling curtain – a shadow or curtain appears at the edges of your vision (peripheral vision) or you see a grey curtain moving across your vision. Failing vision – rapid or sudden loss of vision. You need to have these assessed urgently – on the same day. Over the weekend you can be assessed at an after-hours GP clinic and they can refer you to an ophthalmologist urgently if necessary. You are likely to need drops to make your pupils larger so there is a better view into your eye. If possible bring someone with you who can drive you home again while the drops wear off. Written by Canterbury Optometrists. Adapted by HealthInfo clinical advisers. Endorsed by clinical director, Ophthalmology, Canterbury DHB. Page created June 2015.